A civil society convention in New Delhi has taken strong exception to the National Development Bank (NDB), which is the joint initiative of the five BRICS countries -- Brazil, Russia, India, China, South Africa -- for failing to define “sustainable infrastructure” even as seeking to promote it, wondering whose interests it is serving. Held ahead of the NDB’s Second Annual Meeting of the Board of Governors of the New Development Bank, which began on March 31 and will end on April 2, 2017, the meet, titled, “NDB: Peoples Perspectives”, was addressed by academicians, economists, environmentalists, journalists and indigenous communities from BRICS countries. Focusing on issues related to the lack to transparency, accountability, benchmarks about the environmental and social, grievance redressal mechanisms, and spaces of engagement for the civil society organizations and peoples’ movements in NDB, the convention decided that it would come up with a detailed response to the outcomes of NDB meet. Speaking on the occasion, Ciao Borges, a lawyer representing Conectas, a not-for-profit organization with the consultative status from UN-ECOSOC from Brazil, said, “the NDB given its wide implications ought to have an accountability and transparency structure.” The convention was held on March 30. He said, so far the Shanghai based Bank, which claims to focus on ‘sustainable infrastructure’, has approved seven investment projects in all member countries for a total of over USD 1.5 billion, with 75% investments on renewable energy. Despite this, he said, the Bank has not felt the need to define the concept of sustainable infrastructure. “This leaves the door open for investments which are profit oriented and not completely sustainable in nature”, he opined. Soumya Dutta, convener, Climate & Energy Group of Beyond Copenhagen Collective, and one of the founders of India Climate Justice Platform, said that none of the investment made was related to health, education etc., and all has gone to construction of roads, solar and hydropower plants. “All this achieves considerable significance in the wake of recent statement of Bank’s president KV Kamath, who announced that the Bank would double its lending every year over the next 2-3 years to leverage its USD 10 billion capital in first 6-7 years”, Dutta added. 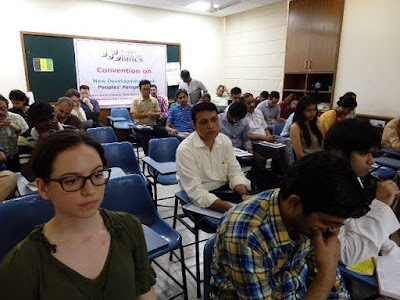 Others who addressed the convention included Nagesh Prabhu, Prof Biswajit Dhar, Leo Saldhana, Atul Bhardwaj, Ram Wangkheirakpam, Himanshu Damle, Benny Kuruvilla, and Joe Athialy.